Sometimes lately I feel like a 1950s housewife. We haven't gotten Herb's car inspected (is it worth it? who knows), and are sharing one car. This means I take Herb to work in the morning, I stay home, or I walk to his work to get the car if I need to go somewhere. Don't worry, work is only a mile away, and tell me I can't use a little extra exercise! We are knee deep in potty training and after I depleted the last pack of diapers, I declared, "No more buying diapers." I didn't consider naps and bedtimes though, so I am using solely cloth diapers for that. 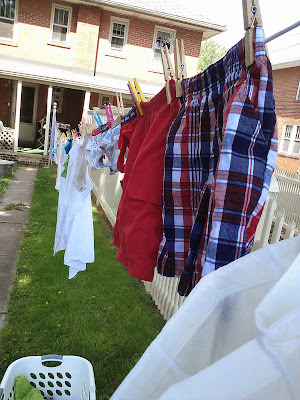 I figured if I'm washing 4 outfits of day for Levi anyway, why not throw in an extra 2 cloth diapers a day, too? Our dryer broke. Boo!! It was free, so not a huge financial loss. I think my dad and hubby can probably fix it, but there are too many other fun things to do with a Saturday morning, am I right? Amazingly, though, it broke in May, just as the weather was turning from pretty nice to beautiful 90% of the time. My only complaint about line drying all my clothing was the stiffness. Sure, fabric softner would have helped, but I didn't have any, and the whole dryer ordeal happened on an off-grocery week - meaning I didn't plan to go to the grocery store for at least 5 more days, so I needed a solution - and fast! My clothes were itchy! And smelled weird!! Of course, I consulted my life assistant, Pinterest. She did not let me down. I found this recipe, which uses a combination of vinegar, rubbing alcohol, and lavender essential oil. It is beyond delightful. My clothes smell awesome and I can't believe how much softer they are. And now, I sound like a 1950s housewife turned commercial actress. I'll end here. But seriously, try the vinegar-alcohol-lavender stuff.